When Daryl Hall wasn’t making hit albums and singles with John Oates (along with the occasional now-forgotten song), he certainly kept busy during the 70s and 80s. * In addition to writing and producing, he also recorded some music on his own. American terrestrial radio has pretty much forgotten, but he had some success in the mid-80s with a hit called “Dreamtime”. Given the wild success when he collaborated with John Oates, it isn’t that surprising that Mr. Hall’s solo albums were rather few and far between. More surprising is that his first album, Sacred Songs, was shelved by RCA Records for about three years. 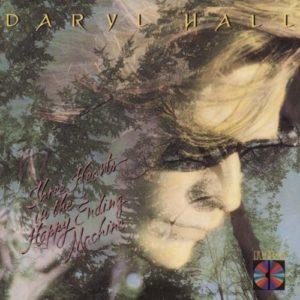 ** It was six years after the first album’s release (nine years after it was recorded) before Daryl Hall released another album, 1986’s Three Hearts in the Happy Ending Machine. Recorded while he and Mr. Oates were taking a well-deserved breather after about 12 years straight of recording and touring, Three Hearts in the Happy Ending Machine was much more of a commercial album than Sacred Songs, and it showed in the chart successes of both the album and the singles from that album. In what might seem a strange pairing, one of the producers of the album, other than Mr. Hall himself, was Dave Stewart of Eurythmics. The first single from the album, “Dreamtime”, was an uptempo song about a woman who thinks her problems could be solved by running away with someone else. Mr. Stewart can be heard prominently on this track playing lead guitar. “Dreamtime” debuted strongly on Billboard’s Hot 100, coming in all the way up at #54 in its first week on the chart, the week ending August 2, 1986 (chart | magazine). Two months later, it hit its peak at #5 (chart | magazine). In all, “Dreamtime” spent a respectable 15 weeks on the Hot 100, performing well enough to reach #94 on Billboard’s year-end chart for 1986 (magazine). The song also appeared in an interesting array of other charts, from the Album Rock chart to the Dance/Disco chart. Following “Dreamtime”, two more singles were released from Three Hearts in the Happy Ending Machine, “Foolish Pride” and “Someone Like You”, but neither really came close to duplicating the success of the album’s lead single. Following that, it would be another seven years before Daryl Hall released another solo album. He would, of course, continue to work with John Oates following his one big solo hit single, as he still does now. And what has become of “Dreamtime” since its 1986 chart run? Well, as with most of the songs on this site, it pretty much disappeared from radio stations’ playlists as soon as it dropped off the charts. I’m not aware of any terrestrial station playing it (unless, of course, they’re airing a classic American Top 40 show). It would be nice to hear this one again. * For that matter, he keeps rather busy even now. ** Apparently RCA didn’t think it had the potential for commercial success. The label may have been right; while it charted well on the album chart, Sacred Songs did not yield any charting singles.